Stephen 'Stevo' Lee, pictured above with All Ireland Winner Johnny Cooper and the coveted Sam Maguire Cup, will travel to Austria to compete in the Special Olympics, with the Opening Ceremony takign place March 18th. Joining the ranks of fellow Olympian and Scoil woman Ellen Keane, Stevo will be representing Ireland in the Floorball event and will no doubt do family, club and country proud. Known for his radiating smile and never-dying positive attitude, Stevo is an avid Dubs supporter who never misses a day out in Croker. It was great to see Dublin Footballer Johnny Cooper in Cumiskeys Pub on Friday night to wish Stevo good luck at the table quiz organised by his dad Sean; pictured below (Meet the Members) with Sam Maguire surrounded by Scoil men! Everyone in Scoil wishes you the very best of luck Stevo - even if we aren't as famous as some of your other well-wishers! Frequently called "Morbs" but "Pedro" and "Peadar" quite common too. Grew up on a farm near Claremorris, Co. Mayo and completed secondary schooling at local St. Colmans College. Resident for the past 40 years in Glasnevin. I was encouraged to join the Club indirectly through a work colleague who was already a Club member. He introduced me to a wider circle of Club friends, one of whom was quite persuasive. Briefly describe your Scoil career as a player / mentor / contributor. I trained with adult players initially but never played with the Club. Perhaps sorry to say was more involved with soccer---played, managed and refereed. In the latter case was a Grade 1 referee in Leinster Senior League for 25 years. I would be most familiar to club members from my work on Grounds management and in a social setting for my rendition of "Mother mo Chroi" after a few pints. In terms of highlights of my career to date, the opening of clubhouse in 1989 was a milestone. It was also great to be around to experience the joy and excitement when we won two Senior Football Championships in 1983 and 1986. I was particularly overjoyed when we regained Senior status in that epic win over Na Fianna a couple of years ago. I derive great satisfaction in contributing to the efforts being made to continue the upgrade of the playing facilities. My intention after leaving School was to become a secondary teacher. However, I accepted an offer of a clerical post with Dublin Corporation(DC). I completed a BA degree at night in UCD. In the meantime my career with DC was going well and I abandoned the idea of teaching. Throughout my working career I was always interested in the Irish language and to improve my writing skills I completed a special Diploma course approx 10 years ago through NUI Galway. Very limited hobbies outside GAA. Enjoy playing golf occasionally, however badly. If you could make one addition to Scoil in any way, what would it be? With apologies to the Bird Conservation fraternity I have a lifetime ambition of creating an unwelcome environment for the Brent Geese who loyally visit us annually. On a more serious note, my ambition will be always to influence and develop opportunities to enhance the playing facilities. Often involved in a bit of banter with club members, particularly in dressing room pre-training. I pick up on some verbal exchanges which give me an opportunity to be pedantic. eg. when to use "good" and "well" or "number" or "amount". Does one say "I'm feeling good"or "amount of players". Grammar is obviously being taught differently from my time! I suppose to look ahead it is important to review how the Club has developed over past 20 years. The addition of Ladies Section is now nearly a club in itself and it has been very instrumental in energising the Club as a whole. The suggestion of reviving camogie is very worthy of support. Despite some "gaps" currently at juvenile level I am confident that in 10 years time we will be competing successfully with the best. I'd like to be associated with the working practice of beavers. They have a reputation of working tirelessly and good management of their own environment. Scoil Senior Footballers had another successful outing on Tuesday night as they claimed a worthy win vs neighbours Clontarf in Pitch 35 in St Anne's. This win was following a first round Cup victory vs St Pats (Donabate) in Scoil on Sunday morning. The Adult Hurlers recorded their first victory of the season in a challenge match against Ratoath of Meath. Most pleasing on the night was the contribution given by the three Minors who togged out on the night. Eoghan Mc Kay, Robert Kennedy and Sam Callan wrere not found wanting in either skill or commitment on the night. The future is bright for Scoil Hurling if these lads are anything to go by. The Hurlers next outing is this coming Friday in Alfie Byrne against Whitehall Colmcilles. The management and team want to wish a speedy recovery to Odhran Lowry who is recovering from injury, Odhran recently featured for the Adult Hurlers in their game against the Laois U21’S. On Saturday, a group of excited and enthusiastic U8s started what will hopefully be a long and happy journey at Scoil with our first football league game against St Peregrine’s. We fielded three teams which meant that all of our panel got significant game time. Each team more than held their own and the coaches were particularly pleased to see that skills were transferred from the practice sessions to matches. There is no doubt that they are turning into a great bunch of skilled footballers. The large group of vociferous Scoil parents and well-wishers who made the long journey was a great motivation for the mentors and players alike. All players tried their best and showed commendable skills and team spirit. Particularly noteworthy was Abigail’s point scoring feats and Oisin’s fantastic kick outs for the blue team. The red team’s Tadhgh and Priya were resolute in defence and never allowed their opponents to gain possession of the ball. The yellow team’s strike force of Cian and Paddy caused all manner of problems for the defence and got some lovely scores from play. On Saturday 25th, we play our first hurling match vs O’Toole’s at 11:00 in Blunden Drive. Hopefully we will have a similar enthusiastic turnout from players and parents alike. 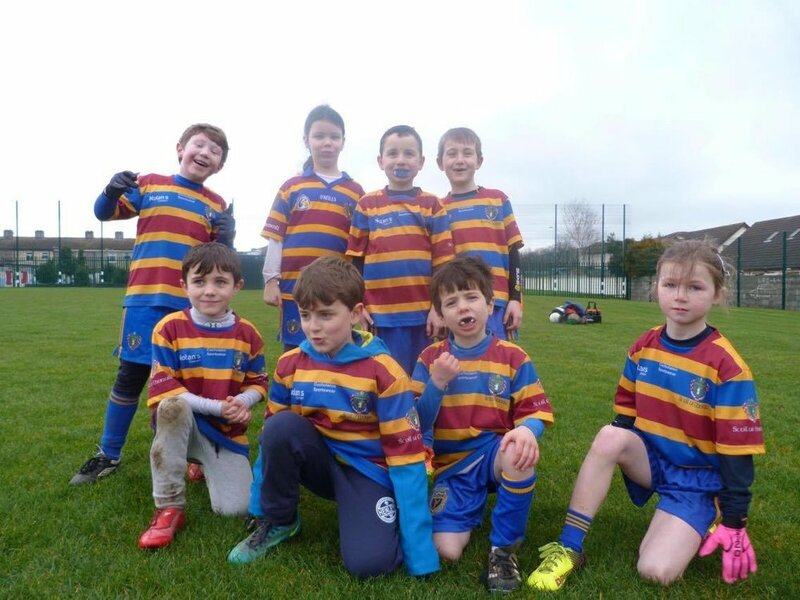 Scoil Under 10s knew they were in a battle last Saturday after O’Tooles got the first two scores of the game. Scoil settled and started to play some very good football and stood up to the hard tackling of O’Tooles with excellent play from Fionn, Conal, Adam and Alan in a very strong spine. great runs and was unlucky not to get on the scoreboard with a few efforts just going narrowly wide. Tighe picked up a knock early on following a late challenge but he shook it off and was very solid at the back for Scoil with some important clearances. Scoil U10's travelled up the Malahide Road to take on O'Tooles on Saturday morning. It was great to see so many new kids represent the club from O'Connells School - Super additions to our team/club. Team Ronan Murphy pulled off the win with great fight back today with Adam Ryan coming in for some "special attention" from opposition! Thankfully his dad Liam was managing the other team in absence of JP & didn't see it. An absolutely fantastic team performance from the U11 boys this week vs Finians in their 1st outing of the new season. Every player gave it their all with scores coming from all over the pitch and some fantastic passing throughout the pitch. Defensively, the guys made it very difficult for Finians to break through while Cillian & Rory did great jobs in goal! 3-4 new kids really helped the team today and we hope to see them coming back next week. Great start but key we keep working hard week in, week out. A lovely afternoon did not start well for the Lightnings, whether it was not enough sleep or a poor warm-up routine the guys found themselves 4 goals to nil down after 12 minutes against a big Cuala team. After some choice words of encouragement from the side lines the guys finally realised that while they may not have had the height advantage of the opposition, they had the better skills, speed and teamwork. It was ultimately this teamwork and the willingness of all the players to track back and put their bodies on the line were the difference. The likes of Senan, Realtin and Joseph epitomised this in the backs, Conal in midfield was superb while having to deal with a "Man Mountain" of an opponent in midfield, his skills ensured he had him in his pocket all day and it was his and Dylan's delivery into the forwards for Caden, Devon, Tony and Roan to deliver the scores. Overall a magnificent performance. A much depleted under 12 football Thunder side took to the field at Naomh Mearnog for their second competitive match of the season. The team were missing a number of key players but were boosted by Ricardo, Jonathan and Andre who made a special appearance from team Lightning. Mearnog were stronger from the start, utilising the ball better than Scoil and racing into an early lead. The Scoil backline of Oisin, Jack and Cillian were under pressure from the start. Despite conceding a number of early goals Scoil continued to dig deep with Eanna ably contributing from half back and Rory holding the ball up well in the forward line. Cathal got the first Scoil goal after a long speculative effort into the box which was followed up by a couple of fine points from Brendan. Mearnog rallied and their slick interplay kept the scoreboard ticking over. After the interval, Mearnog pressed home their advantage with a couple of early goals. Scoil refused to lie down with Stephen busily closing down plays around the middle of the field. Oisin and Cillian showed their mettle and blocked a number of potential goals but inevitably Scoil began to tire and Mearnog ran out worthy winners in the end. The U13 boys played their second grading match of the season on Saturday afternoon the 18th February at Kilmacud Crokes pitch in Deer Park Stillorgan. Scoil led from start to finish in this one sided affair. The improved support play from all the players was evident and the tri-weekly training over the winter period is now bearing fruits in leaps and bounds. Thanawat and Sean kept the pace going right throughout the match. Two late goals by Crokes was a little too late to affect the overall score-line. Well done to all the team, keep up the effort and keep making the training sessions. na Fianna had just come from a very high scoring win the day before against Fingal Ravens so this was always going to be a tough encounter for the Scoil lads. Due to weather conditions two weeks ago this game was originally postponed and re-scheduled last Sunday the 19th in Na Fianna's grounds in Collinstown. This was probably the best game they played this year against a very good defence. Na Fianna led for a large portion of the first half but Scoil got back in the game near the end of the first half and dominated the second half. Great performance from our backs with Oisin, Nikhil, Max, Conleth, Borna, Sufyaan and Blaine. Special mention to Pongasat and Thanawat who played exceptional as sweepers and well done to Donal, Zack and Stephen who contributed to this fine win up front. Well done all. The Minor Hurling League fixtures commenced last weekend but the Isles of the Sea (combined Scoil Uí Chonaill and Clanna Gael Fontenoy) minor team, in our 5th season together, had a bye. Minor Football League commences next weekend and the team have another bye! Strength and Conditioning training as well as football and hurling training continue. Wishing a speedy recovery to Odhran O'Sullivan Lowry who dislocated his shoulder recently and to Eoin Barron (Clanna Gael) who broke his leg last week. Scoil Hurling #1 getting some heavy leg shot stopping in. We went easy on him as it was his 7th round!